Taking all of the above into account it is possible to now try to put some form of value against the elements in question. Hardware and software are pretty competitive environments and thus it is now easy to compare these through comparisons with different suppliers, for this reason we will concentrate on the more complicated area of support and hidden costs. It is possible to remove hidden costs by investing in certain areas and getting the right support where it matters. It is also important to understand where your limits are and where your time is spent best. For example, if your car breaks down you may be tempted to fix it due to some knowledge you have gained in the past, this may be the same for your home computer. However, if i was to suggest that you try to look after the company car or van fleet, you would not even dream of trying. The same can be said for your IT estate, know your limits. As discussed earlier in this document downtime is essential, there are ways to mitigate this by increasing your proactive support. 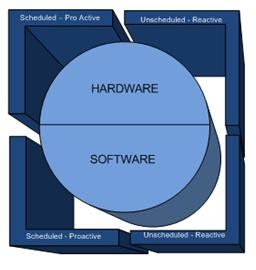 Reactive maintenance is usually in some form or another going to affect downtime, move to a proactive model and downtime should decrease. It is also prudent to select your hardware carefully. Having a piece of kit that has a full guarantee is not going to be great if it breaks every few weeks. Are your users trained appropriately? If they have an application query, does your service / support arrangement allow for this? Can they get answers quickly? Do you want them to have minimal admin rights over the systems?